Many viewers of Super Bowl 53 had the same overall impression – meh. The game was low-scoring, the ads weren’t altogether revolutionary, and the halftime performance led to quite a few not-so-kind memes online. And, as happens every year in the advertising world, many wondered whether the $5 million per 30 second commercial price tag was really worth the air time. Some traditional heavy hitters (we’re looking at you Doritos) took the plunge, while others opted for a more digitally focused campaign that utilized social media to reach audiences. Here are a few commercials that stood out in our minds, for better or for worse. Coke’s theme of unity and celebrating our differences was classic and appropriate for today’s volatile social environment. Opting for illustrations distinct from its typical commercials, Coke stood out from the crowd by echoing the company’s core values. However, while it was a winner all around, other ads generated more buzz online. Had you aired the Zoë Kravitz ASMR for Michelob ULTRA commercial just a few years ago, viewers would have been left hopelessly confused. ASMR is a popular style of content on YouTube but, like most trends online, probably won’t be around for too long. Thus, this quirky ad probably won’t have the staying power of other commercials. Yawn. The Pringles’ commercial utilizing an Alexa-type device fell flat. 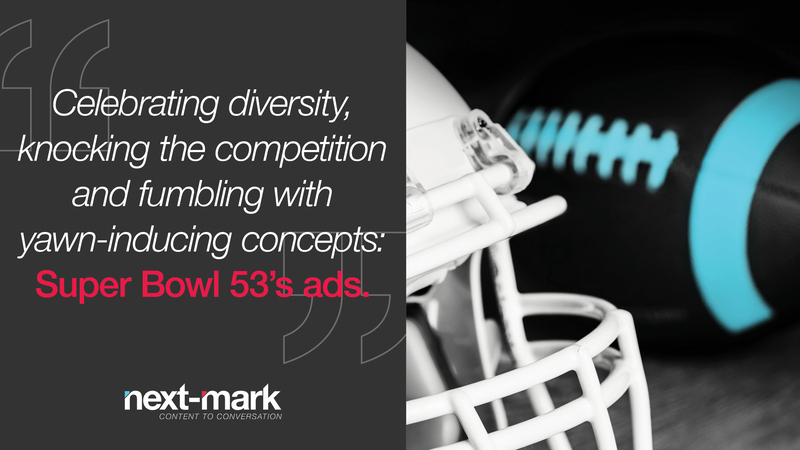 The concept of mixing flavors is old news for the company and was a neutral, yet too safe a bet for the brand. The ad was easily overshadowed by other brands that opted for bolder choices. Olay’s #KillerSkin ad featuring Sarah Michelle Gellar was a winner. Memorable, amusing and timely, this commercial has people in the industry talking. We love that the “story” can easily be translated to the online space and even extended to feature other situations as needed. It was also one of the few that included an easy-to-remember hashtag for quick sharing. Pepsi went for star power with Steve Carell, Cardi B and Lil Jon in its “More than OK” ad. We shudder to think about the cost of the ad and, from our perspective, we’re not sure the price tag was worth the output. The commercial seemed a little too crowded and is the brand association with the word “OK” really beneficial? Another direction may have been a little more effective. Try again next year Pepsi. Bud Light once again didn’t fail to disappoint with its “Special Delivery” ad that soundly dissed its competitors’ use of high fructose corn syrup. It was humorous, well-branded and lit up the Twitter-verse. While the companies Bud Light called out attempted to respond online, their voices were drowned out by the loud praise for the commercial. What did you think about this year’s lineup?